Since fishing lures invented, they have dominated living baits and become the best choice for anglers around the world because of their efficiency and convenience. Although fishing lures can bait any fish on earth, they work best on bass. Before going on any bass fishing trip, the most important question you must ask yourself is that what lures to use for bass that will meet your fishing condition? There are hundreds of types of fishing lures out there. But in this post, I will mention 6 significant types of best bass lures that are those best bass lure for anglers who are seeking for some big bad bass. Of all lures, I would say that jigs are one of the most effective. They have a weighted head and various sizes and colors and customize feathers, hair or soft plastic tail. You can use jig baits to catch almost every fish, especially bass. Another advantage of jigbaits is that they are good to use in any season and any water zone. However, the downside of jigbaits is their high level of handling difficulty. They require very complex fishing technique to reach their maximum efficiency. So if you want to catch some bass by jigbaits I advise you to pay a lot of time to practice and train on your fishing skills. For short, jigbaits are not for you if you are not a skillful angler, but once you were you will definitely find it hard to stop using them. This pro series of terminator jig originally made for pro anglers. With 2-2.5” in length, it has a lot of features to offer such as a uniquely designed head which allows them to penetrate through water cover really fast in just about 3-4 sec and great plastic weed guard prevents them from snags. Along with super strong and reliable VHC hook, I have yet to have any bait slide off when I fish with this bait. Its tempting rattle combine with the incredible black blue purple color really make bass lose their mind. This reminds me of my most productive jigbaits BOOYAH Boo Jig. Its unique design also let them swim extremely stable if you use the right jig fishing techniques. Besides, a tough fishing condition such as raining is when this bait shows off. I usually catch 4-5 bass by fishing this jig under the rain. It works well in musky water and in tight cover water with deep water structures such as rock or timber. Putting a 3-3.5” trailer craw on this ¾ oz. bait, I will catch bass in anywhere. Moreover, $3-4 for a bait this good is a real deal. However, beginner anglers may find fishing with this bait really low efficiency because of their requirement of difficult fishing techniques. I advise you not to challenge yourself with this bait too soon if you don’t want to lose the spirit, but in case you still want to catch some bass with jigbaits I suggest some others easier baits such as Screwy Lewy Lures Paddle Tail Bass Jigs. Jerkbaits, with a wide range of colors and model, stimulate an injured fish who trying to escape from predator fishes. They probably are one of the most effective fishing lures for almost every situation but they give the highest productivity in spring or fall when the water is cold. Jerkbaits actions are fully created by anglers. That is the reason why they are the most versatile baits. They can be fished fast and slow, dive deep or shallow depending on the intention of the anglers. In the other hands, their actions are created by anglers. That means if anglers are not capable of performing any jerking technique, jerkbaits will be nothing more than a colored stick. So if you want to catch some bass with jerkbaits, I recommend you to learn some jerkbaits fishing tricks to make your jerkbaits really a dinner bell to bass. With the length is 2.76”, these jerkbaits are one of the best bass lures you can find on the market of jerkbaits. 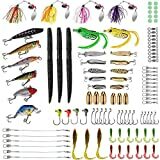 When I am just a beginner angler, I don’t have a lot of money to make the wrong investment on my fishing lures and it is also tough to choose the right baits since I don’t have much skill. But I find these PLUSINNO baits, to begin with, outstanding actions, natural realistic colors and above all they are really friendly to anglers at any level of skill. $16 for a set of these 6 jerkbaits with an elegant portable carry bag is very cheap for one of the best bass fishing lures of their type. Besides, these baits are nothing like their price. Their performances are stunning. After taking 2-3 sec to get to the bottom, they rattle and copy the movement of a dying fish when you jerk it which draws the bass out. And all you have to do to get the bite is doing a few tricks. I recommend beginner anglers to consider trying these baits; they don’t require many complex techniques like some jerkbaits for a pro such as FLW Pro Luke Clausen. It works very well with salt water, for both clear and murky water. However, this jerkbaits is a very good start for anglers who are new to bass jerkbait fishing. But if you get to the higher level of experience, you will find these baits not what you need. To catch 2-3 bass in an hour, it is great but to catch 9-10 bass will be difficult. In the world of bass anglers, it is not too much to say crankbaits is the most familiar lures among all types of bass lures. The baits with a rounded body, designed to copy the look and movement of living baitfish. They are also extremely diverse in shape, size and thousands of colors. The real deal about crankbaits is that they offer a wide range of selection for anglers to choose one fits them the most. Crankbaits can come in any design vary on the size of their lip, the rattling sound they make and most important: how deep can they dive. Moreover, due to their impressive fishing speed, you can easily cover a lot of water in a short time and they are also one of the best bass lures that you can use for many seasons. The downside, however, also comes from what they offer. To choose the right crankbaits to bait some bass, you will need some knowledge about nature, understand your fishing condition such as the depth and the clarity of the water, the season, the structure under the water,… The works will obviously take you a lot of time and require you to pay great effort to finish. The total length which included body and bill of these baits are varying from 1.57” to 3.25”. This set of crankbaits has 30 different baits which include lipless, shallow, medium and deep divers that can dive at the depth of 1-3 feet to 10-12 feet. I have to say that, to me, these baits are my top choice when my budget is tight thanks to theirs insane low price. You can actually get up to 30 pieces of Lotfancy high-quality crankbaits for $21, it is just about $0.66 each. If you don’t want to pay a lot of money for a crankbaits then these Lotfancy set is made for you. Although there are 30 of them any single one of them performs fantastically. It is not too much to say that these Lotfancy baits are nowhere behind my Rapala Shad Shallow; they just don’t have as many movements as Rapala but every else seem to work very well. They dive fast, swim straight so I absolutely recommend these Lotfancy baits for both unskilled and skilled anglers. I suggest you fish with Lotfancy baits when it gets cold and various colors make them available for both clear and dirty water. However, sometime there will be 2 or 3 broken baits out of the box but the chance is 1/60 but that is absolutely not a problem to me; I still make the payment. When someone mentions about swimbaits, the images of some naughty monster bass come across my mind. Usually, swimbaits are lipless, designed to look like big bait fish. With 6-12 inches in size, they can bait from average to biggest fish in the lake. The diversity of the colors gives you the freedom to fish in any kind of water. So if you are an angler who interests in huge size bass, swimbaits are absolutely the best options for you. But swimbaits are not easy baits. The bigger the bass is, the more skillful it requires the angler to be. If you are not yet pro, instead of fishing with swimbaits I suggest you challenge yourself fishing smaller bass and using others fishing lures which fit your level. Besides, fishing with swimbaits require anglers a lot of patients, you may have to stick to your bait all day long to get the bite. With 4-4.5” in length, this bait is decorated with 3D lifelike eyes and super realistic detail copying the profile of an actual fish. Super durable fabric joint and the odorless ABS material body make it very friendly with environment. Without the bill in front, the action of this Lixida bait does not come from diving move, it sinks instead. This bait targets a wide range of predator fish such as yellow perch, walleye or pike but it works best with bass. After having caught 20 to 21 bass in 3 hours, I have to say that this lure is incredible in every aspect. If you want to buy a bait that worth every penny you pay, Lixida swimbait is the one you will want to take a look at. Not only the quality but the performance of this bait is also very amazing. After 2-3 sec smoothly falls to the bottom, your retrieve will make it swim truly with the super life-like action of a real fish. But if you are anglers who love sinking fishing techniques, I suggest you flutter and let it sink slowly on the pause. The action really drives bass wild especially for anglers who seeking largemouth bass in seawater and freshwater. Although the bait is great finished, the hardware still needs some improvement and the hook is pretty to bend or even broken. Moreover, despite this bait’s joint is very durable it still need revision every time you fish. So after 2 or 3 bass fishing trip, I advise you to check carefully the joint of this bait to make sure everything is under good condition. Finesse worm has been around for a really long time in the world of fishing lures and known as the best bass lures of all time thanks to their great productivity with bass. They are the easiest lures that any anglers from beginner to pro can fish with. They work well in any seasons, anywhere bass lives but to witness their outstanding performance I recommend you to finesse worm fishing in clear water. Besides, they come at a very low price for 10-12 high-quality finesse worms. However, these best bass lures have some disadvantages. The colors of these baits are not very diverse. The most effective colors are dark in tone. For this reason, I don’t think it is a good idea to finesse worm fishing in dirty water. The finesse worm trick is quite hard to perform fluently. With the length is 5 inches in total, this bait is one of the most versatile baits for anglers from beginner to pro to catch bass with. There are plenty of tricks you can perform with this worm bait such as Drop Shot, Wacky Style or Finesse head. I usually pitch these at the shorelines from a boat, or down the shore one way or the other if fishing from the banks. Rig this Baby Bass color worm in Texas style, weedless, and weightless, and cast them into coverage under the water like fallen trees, shadows, lake grass, etc. By retrieving it insane slowly, about 3-5 sec per meter, you make the bait the natural movement of a real worm crawling. And remember the slower the better. The bass typically bites on the drop or within 5-10 feet of the shore during the retrieve. The only thing annoys me is its plastic smell. I think Zoom made this bait smell because they want the bait to be more real. But sometimes the smell makes me feel a little bit dizzy. With $6-7 for this Zoom wormbait, I guarantee you will never regret. Crawbaits, which are made of soft plastic, imitate the profile of the crawfish. One of the biggest advantages which makes people use craw baits is that these baits can catch a numerous of bass in the lake because crawfish are everywhere and they are favorite serve to bass. These baits show outstanding performance in fall when water is relative cold. Besides, they come in various colors choice which makes them visible whether the water is clear or musky. So if you want to fish some bass with crawbaits, I suggest you fish with crawbaits to maximize the productivity. But, the thing I don’t like the most about crawbaits is that their performance depends considerably on the characteristic of the water where you about to fish. In tough condition or bad weather, crawbaits may not hold up well and their efficiency is very poor. Moreover, if you are a beginner, I think crawbaits are not for you because of their difficulty to master. Measured at 3.5” and has the Water Candy Red color, this bait is among the top crawbaits for bass fishing because of its great quality and action. It has a beautiful and durable design with extremely soft and salt-impregnated plastic body. After using for a time I find this bait efficiency in many different ways with different fishing techniques. With some basic techniques such as Weighted Texas rig or Weightless Texas rig, it will get you about 4-5 bites in an hour and maybe 9-10 bites if you perform some advanced technique like Jig trailer or Carolina zig. It also finicky bass even in tough conditions. With pretty loud noise and the crawfish-like water candy red color really make this bait one of my most attractive bass caller along with my favorite Netbait Paca Craw. Besides, to maximize the bites you get, I recommend you to fish this baits in the area where bass living baits are mostly crawfish such as on top in Lily Pads Lake, where I usually catch 10-12 bass whenever I fish with this Zoom crawbait. Zoom Ultra Vibe Speed Craw is one of the most affordable crawbaits for bass on the market. While the average price of crawbaits out there is $8-9, this bait only cost you $6-7. A steal deal for any anglers who are looking for a high-end crawbaits. Savage Gear 3D Craw available in 3” or 4 ¾” in size. Using 3D scan technology procedure of a living bait, it owns every detail of a real crawfish making it stands out from others crawbaits by its ultra-realistic appearance. Thanks to its high-quality life-like design and outright performance, I guarantee Savage Gear 3D Craw will not make you disappointed. To bring more the feeling of looking at the real crawfish, this bait also has exaggerated antennae and 4 pairs of legs just like a real crawfish. The action of this crawbaits comes from its extraordinary ability to float. If you are a beginner, you don’t have much experience with crawbaits fishing then I highly recommend you Savage Gear 3D Craw because it doesn’t require you to have much skill to fish productively. Flipping it with a stand-up head over and over again giving this bait the look of a jumping craw, you will have no idea why bass keeps coming. Swampy Lake and the area of crawfish habitat are great for using this bait. Lipless Crankbaits, which has the design like Crankbaits but with no bill on the front, are one of a great tool to catch bass in a short time. 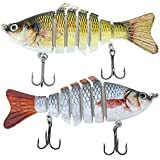 Many people choose those baits to fish with because of their unique rattling sound, which seems to be the noisiest sound of all type. Their design makes them one of the best bass lures for smallmouth bass. They are available in tons of color options for you to select so you don’t have to worry whether the water is clear or dirty. Lipless Crankbaits give the highest productivity in spring and fall when the water getting cooler. Due to their origins not having bills that means they will not going to dive as deep as others type of fishing lures. But since they don’t have bills, they become the most popular shallow bass lures to anglers from beginner to pro. wLure Minnow Crankbait seem to be quite small compared to others, it is only 2¼” in length. These have some point I don’t really enjoy as well. It’s quite light just 1/3 oz. which makes them sink a little slow. Sinking slowly may make them look not so natural when the water is crystal clear. However, they are still great lipless baits for bass. Like everything else, budget plays an important role in choosing your fishing lures. If you have a lot of freedom on your budget, choosing your own fishing lures is so easy. However, expensive bass fishing lures are not always the best bass fishing lures. There are so many low price fishing lures but still, have outstanding quality such as my $7 favorite fishing lure of all time Rapala Rattlin. The current season affects the water clarity and the water temperature when it changes. In different water temperature, a different type of prey fishes lives such as Fathead live in 25-27 Celsius water degree while Common Shiner lives in 10-15 Celsius water degree. By knowing this, you will find the most appropriate type of bass fishing lures which satisfies your fishing condition. The color of the water or the clarity of the water where you are about to fish some bass is the most vital factor that will directly determine if your bass fishing trip success or fail. It must be very musky if you are unable to see your bait in about 1-2 foot under water. Based on the color of water, you can select the proper type of bass fishing lures with appropriate colors. For instance, in clear water, I advise you to use finesse worm or crankbaits because of they are easy baits but give great outright. At the end of the day, to choose the best bass lures that suit you, you will have to experience each type rather than just read about them. 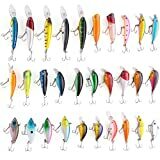 But I hope after having read my post, you will understand the character of each type of bass fishing lures. Anglers, enjoy your bass fishing.